This is an amazing resource for maintaining accurate records of everything that needs to be documented in your classroom. There are seperate tabs that allow you to organize your data by students, personal, and professional. For example, you can quickly and easily document parent phone calls, absences, tardiness, or behavior concerns. It is suggested to keep a shortcut of this document on your desktop; therefore, with one simple click you can document everything within seconds! 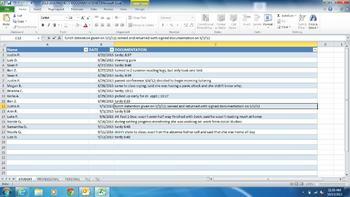 Once you document the information, this spreadsheet then allows you to search by student or date. An excellent resource for compiling a years worth of information! And a handy tool for parent conferences or monitoring students.